Cecilia Fox | Miami Valley Today Ohio Secretary of State Frank LaRose, announced the results of an investigation into the Miami County Board of Elections’s failure to count more than 6,000 votes in the November election. Since January, the Secretary of State’s Office and Director of Elections Mandi Grandjean, far right, have worked with the board, including Deputy Director Ian Ridgeway, far left, and Chairman Dave Fisher, left. 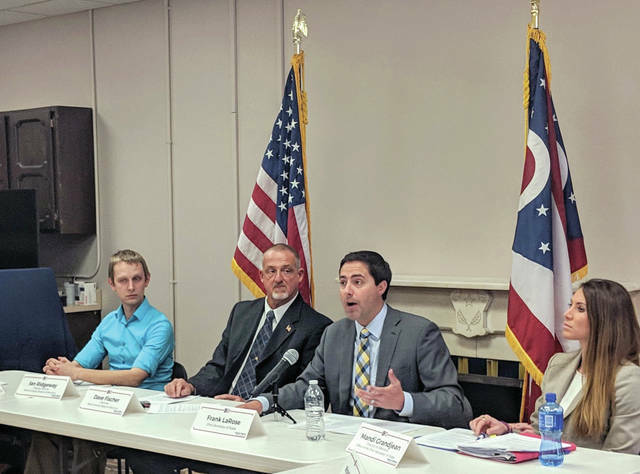 MIAMI COUNTY — According to Secretary of State Frank LaRose, inadequate training and “unacceptable human error,” not malicious intent, caused more than 6,000 early votes cast in the November 2018 election to go uncounted. On Thursday, LaRose released the findings of his office’s investigation, as well as recommendations for improving board operations and regaining voters’ trust. “Right now in Miami County, and rightfully so, there is a trust deficit. The voters of Miami County need to see through our work, through the work of the board, that that trust is well-placed in the Miami County Board of Elections. And they’re going to work to earn that trust,” LaRose said. The current board will remain in place and will remain on state oversight indefinitely. LaRose said that he has no intention of pursuing the removal of board member Rob Long as recommended by the Miami County Republican Party Central Committee in February. “The board members have been very proactive about wanting to get this right and they’re very serious about it,” LaRose said. Fisher added that he has no intention of resigning from the board. The Secretary of State’s Office now requires the board to create a “thorough and specific” set of procedures, update its Election Administration Plan, ensure its staff receives extensive training and conduct a test election in July or August 2019. LaRose said his office spent hundreds of hours investigating the error and determined that there is no evidence of any “unlawful or malicious” action nor was there any technological malfunction on Election Night that caused the 6,288 early votes to go uncounted. The uncounted votes did not affect the outcome of any race, LaRose added. Board of Elections staff tasked with shutting down machines used for in-person early voting, the same machines used on Election Day, missed an extra step necessary for processing early votes. Because the machines were not shut down properly, thousands of votes were not counted. “This was simply human error — unacceptable human error — but human error nonetheless,” LaRose said. The investigation found that staff were not provided proper training or given any documentation needed to shut down the machines. Board of Elections Chairman Dave Fisher said he and the other board members were “sick” when they found out that more than 6,000 votes were not counted, a mistake he vowed will never happen again. “We disenfranchised some of our voters and that should never happen again. And it’s not going to happen again because we’re putting processes in place to make sure we take care of every vote,” he said. Fisher said he and Long noticed an error in the preliminary results on Election Night, but were assured by Director Beverly Kendall that the error had been resolved. In January, the board fired Kendall, a decision Fisher said he stands by. Deputy Director Ian Ridgeway has overseen the Board of Elections Office since January. In March, former board member Ryan King’s term expired and he was replaced by Jim Oda of Piqua by the county Republican Party. Dave Fisher was appointed by the county Democratic Party to another term this year. The error was discovered by the Ohio Secretary of State’s office in December and the board was placed on oversight in January. Since Jan. 29, the Elections Division of the Secretary of State’s Office has hosted weekly conference calls with members of the board and board staff. Investigators conducted interviews with board members and staff, as well as the former director. Interviewers also met with the board’s voting system vendor. The Elections Division and the Board of Elections have worked together to update the board’s policies and procedures. Fisher said 64 policies have now been improved or put in place. Voters will use the current touchscreen voting machines at least one more time for the May primary. The board voted in January to purchase a new voting equipment system, a paper ballot system with scanning equipment from Clear Ballot, which Fisher said should be in place for the November 2019 election. https://www.dailycall.com/wp-content/uploads/sites/30/2019/04/web1_IMG_20190404_152056-2.jpgCecilia Fox | Miami Valley Today Ohio Secretary of State Frank LaRose, announced the results of an investigation into the Miami County Board of Elections’s failure to count more than 6,000 votes in the November election. Since January, the Secretary of State’s Office and Director of Elections Mandi Grandjean, far right, have worked with the board, including Deputy Director Ian Ridgeway, far left, and Chairman Dave Fisher, left.